We do this by providing meaningful experiences drawn from the world of work that many people take for granted. 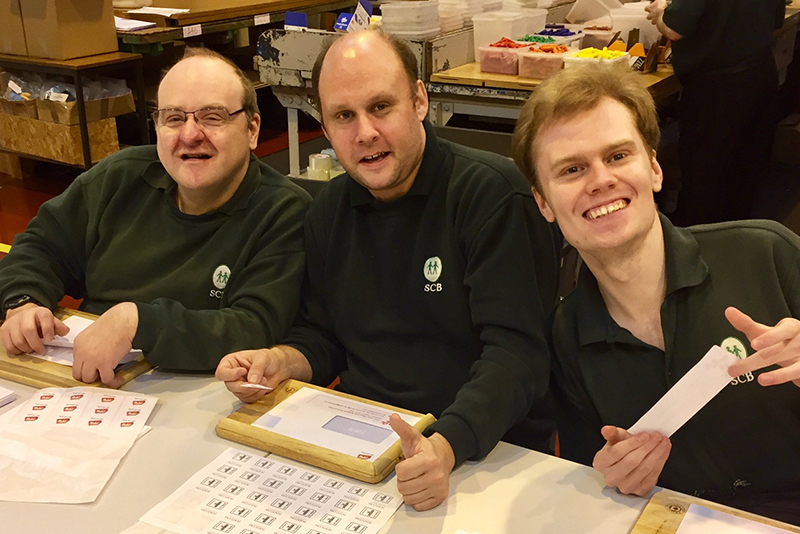 Since we were established in 1998, our aim has been simple: to support ambition in special needs individuals and enable them to fulfill their potential. As a result, at SCB, we often see our Service Users develop and grow and the feedback we receive from both them and their families tells us that we are achieving our aims. We often see our Service Users flourish in so many ways and from the moment they join us, we witness levels of personal development that allows them to interact with others and undertake tasks that many would not have thought possible just twelve months ago. This comes about through providing the opportunity to interact with others throughout the working day and by undertaking simple but achievable tasks whilst receiving instruction and support from dedicated staff. Progress is carefully monitored, with regular reviews being carried out, as skills are built up towards the possibility of an external placement. As a result, our ‘placements’ are extremely popular and once with us, our Service Users are reluctant to leave. However, if you feel that you know someone who would benefit from joining us, take a look at our referral process below to find out more. Once a Service User has expressed an interest in attending SCB, we arrange a suitable date for them and their primary Carer to attend the Workshop for an informal visit. We also often receive referrals from other organisations that work with special need individuals. If the visit goes well and all parties are keen to apply for a placement with us, we ask the primary Carer to complete and submit an Application Form to us. Each Application is considered by our Board of Trustees and if successful, a two week trail period is agreed during which the applicant can experience daily life with SCB. This also includes an Induction process in which important aspects of work such as Health and Safety is covered. Following the two week trial period a review is carried out, with both the service user and their Carer, based on observations made throughout the placement. If the trial placement has been successful and all parties wish to proceed, a three month placement will be offered, subject to availability. Placements are funded through an individual’s care package (personal budget), following an assessment by the local Council. Throughout their time with SCB, all Service Users are trained in many aspects of working life. This includes learning valuable skills such as numeracy, identifying components, tool use, accuracy and precision, the need for quality, coupled with a sense of pride. Service users are rotated through several tasks over the course of the week, to give variety and stimulation. All work at their own pace and to their own ability, with support from dedicated staff. Over the course of a year all service users are able to work towards the annual award of the ‘David Hough’ trophy, and associated certificates. These awards are aimed at recognizing achievements made during the course of the previous twelve months and offers service users an achievable goal to work towards. The David Hough Trophy was introduced in 2002 and is awarded to the service user who, in the manager’s opinion, has made the most progress during the course of the previous twelve months. A monthly record of tasks undertaken, achievements attained, and progress made is kept throughout the year, to help us make the right decision . At the start of each December,a short list of six service users is drawn up and the Award is presented at the annual ‘End of Year’ party. The award covers all aspects of the service users’ placement, including: – social interaction, conduct & attitude, motivation, timekeeping, numeracy & monetary skills, tasks undertaken, and personal goals attained. All service users, including previous winners of the award, are eligible for the trophy and judged on their individual ability.